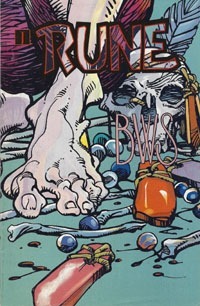 Lukasz has only just begun to figure out what this new body can do, but has already been captured and after being knocked out, wakes to find that Boneyard’s got designs on wedded bliss! We open on Boneyard standing over Mantra, ranting about how insignificant this woman is, as if it’s so ludicrous that this final warrior might be the last hope of Archimage. As Mantra, Lukasz fights back, and manages to escape the imminent wedding between Boneyard and Eden Blake’s body, which he presently inhabits. He finds and interacts briefly with Archimage, and is unable to get the old wizard free. Barely escaping, he seeks help in a nearby village, only to be betrayed by newfound allies. Warstrike manages to show up, and is convinced to assist an assault on Boneyard’s keep. Ultimately, he and Lukasz are forced to retreat so that they might fight another day. Despite the betrayal, Lukasz–as Mantra–does manage to make some new allies in Boneyard’s realm…a factor sure to come into play later. 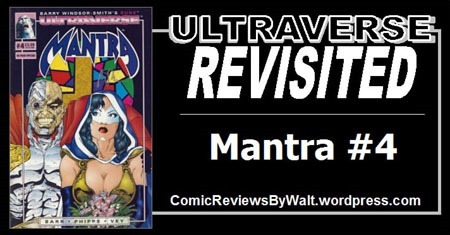 This may have been the first issue of Mantra that I ever read, due to getting it during Rune Month, and while not gratuitous, the cover certainly would have had my attention–between Mantra herself, the weird cyborg Boneyard, and the bright colors. At minimum, this would be the second issue I ever read of the title, and whatever order I read the issues in, I had missed issues 2 and 3, so had only the first issue and then this to go on. The story takes us into an interesting realm–somewhat fantasy-ish (think Game of Thrones)–not quite Earth, but not entirely alien. We continue to see Lukasz finding the power of Eden Blake’s body, as well as a growing perspective on how men–and he himself–have treated women over time, particularly with bodies such as this. We get some face time with Archimage to propel things onward–contact, yet it’s not quite time for THE rescue: the story is still unfolding! Warstrike continues to be an interesting ally…perhaps moreso because I know that he gets his own series in the not-too-distant-future relative to this issue. Visually, this is a solid issue; I like the characters’ depictions, and the flow of the art in conveying the story. It definitely has its differences from the title’s premiere…but hangs onto a good bit of the visual style and familiarity, such that I don’t know that I’d REALLY notice any particular difference if I was simply reading without paying attention to the credits! As (Agent?) Jaffrey follows up on Stone’s death, he, too, is attacked by Rune. Rune is fiercely seeking a particular boy…who we meet as the segment closes–interrupted on a phone call with his girlfriend by his father needing to talk to him about something. This is the "penultimate" chapter of Rune #0–We’ve followed Rune through time, seeing him in his powerful younger days, how he came to be the wretched creature he is, and along his quest for restorative power. That he’s seeking Erik suggests more for Erik to come…though this chapter does not let us know exactly what role he’ll play overall. Yet (as always) again, the art is good, and it’s consistent with the earlier chapters, this being simply the next three pages of (still) the same issue, essentially. Once more, the Rune chapter sorta works by itself but there’s no real room for "context" on the pages themselves. In a way we get more information from the "previously" text presented ahead of the chapter than from the pages…something I’ll be interesting to evaluate in a later re-read of this story in a single go. While it adds value to the issue, it is not in itself a sufficient selling point to seek out this issue. 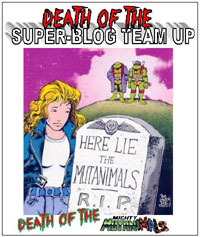 On the other hand…the Mantra issue itself is another strong chapter, continuing to build on characters and continuity, as we see more of several characters and their interactions, as well as Boneyard having realized who and what Mantra is, and checking in on Archimage, and generally leaving a bit of wonder in the "will he or won’t he" (Archimage) be rescued this issue. But it’s not to be, as there’s more story to be had by his not yet being rescued than a quick 4th-issue-rescue. Whether it’s the general story, or the art, or the concept, or something else, or some combination…I continue to find this to be a series I’m highly eager to get back through, that almost leaves me regretting trying to cycle through all the titles by month rather than doing a single-title read-through of Mantra. This adds to the reaffirmation of the title as one of my favorites of the Ultraverse, whatever other titles I discover that I enjoy and "should have" read as a kid. By itself, this issue is definitely worth a quarter to a dollar or so…definitely a "bargain bin issue," not likely worth more than $1 or so unless you’re plugging a run in your collection. Still, it’s a good issue, I myself enjoyed it, and I look forward to the next issue, as well as a number of other issues yet to come! Once I saw the first picture I knew this story was from the 1990’s! The Ultraverse comics epitomize ’90s comics for me. Isn’t it amazing how there are just elements about comics that can scream what time-period they’re from? Whether it’s paper, or coloring, or cover dress/style, or particular (popular) visual interpretations of characters, etc? Since these earliest issues, I’ve always loved the corner boxes style, with the Ultraverse logo across the top, and the inset border.